Crack open your beverage of choice as Dennis from the American Dirtbags Podcast joins this weeks edition of Bumming with Bobcat! Molly is missing, but we are getting the party started and getting all the low down on their new podcast, The American Dirtbags. They are only four episodes in, but the sky is the limit! Dennis and Bum Wine Bob discuss the Chuck E. Cheese's pizza controversy, the internet wrestling community, classic drinking stories, and just life in general during this ... See More episode. 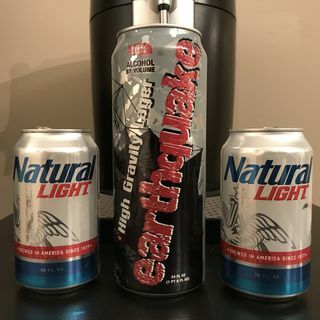 Earthquake High Gravity Lager has a new look, but why haven't they used legendary WWE Superstar, the late great Earthquake (John Tenta) as the spokesperson? You're sitting on a goldmine here guys! Don't forget the check out the 2018 NFL Season Tall Boy Thursday Recap and the 211 Day tribute post from this past week!